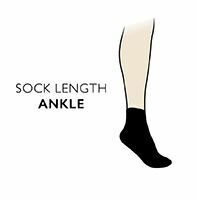 Made to be thin enough for today’s minimalist sports shoes, but durable enough for the daily grind of exercise, ToeSox Lightweight Full Toe Ankle Sports Socks are perfect for barefoot running, cycling and climbing shoes, with their separate toe design. This unique design promotes five toe natural movement so toes can activate and interact properly, even in shoes, improving balance and agility. A vector heel and arch support band improves fit and helps stablise the foot. ToeSox sport toe socks create a blister-free environment for toes by preventing skin-on-skin friction and moisture, allied to the fabric’s Perf Dry moisture management system, which uses channelled synthetic fibres to pull moisture away from skin for fast evaporation.